BEST Party Hostel in EU! – Ryans-Air-Adventures! BEST Party Hostel in EU! 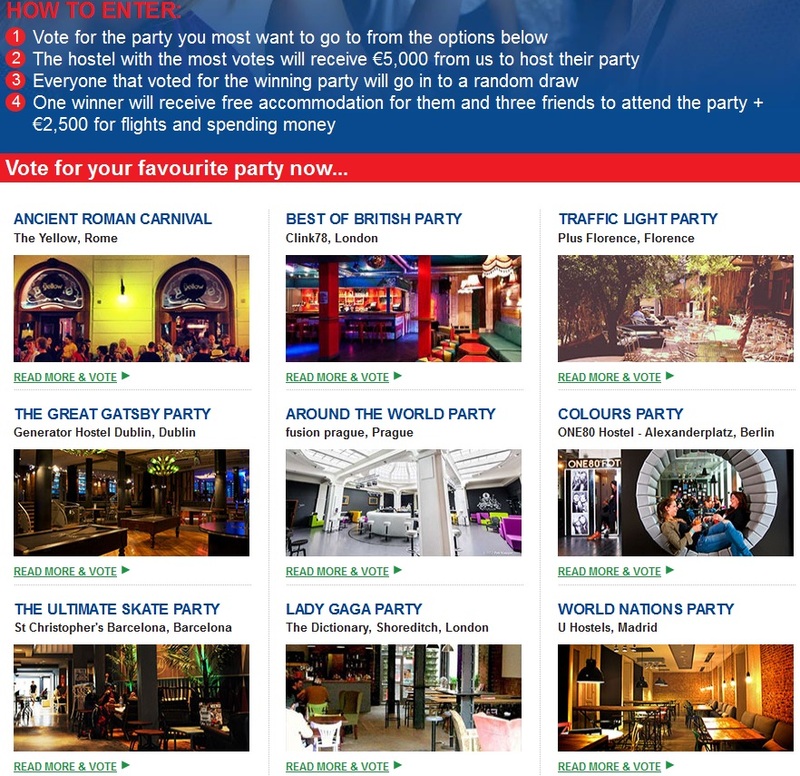 Just launched over here at HostelBookers is our latest campaign…Time to find the ‘best party hostel’ in Europe! PLUS Florence, One80 Berlin, Generator Dublin, The Dictionary London, Clink78 London, ‘fusion prague’, U Hostels Madrid, The Yellow Rome and St. Christophers Barcelona. Each property has pitched their individual party proposal. By utilising their own social media, press and vote canvassing strategies, the winners will get 5K to blow on a huge bash and be crowned the ultimate party hostel! Get voting for your chance to win… Good luck! This entry was posted in Backpacking, Beach Break, Budget travel, City Break, Holiday ideas, Hostel Industry News, Hostels, Travel and tagged best party hostels, Clink78 hostel, fusion hostel prague, fusion prague, Generator dublin, hostelbookers competitions, Hostels, One80 hostel, ONE80 Hostel - Alexanderplatz, party hostels barcelona, party hostels berlin, party hostels dublin, party hostels florence, party hostels in europe, party hostels london, party hostels madrid, party hostels prague, party hostels rome, Plus Florence, ryan bennett, ryans air adventures, see the world for less, shoreditch hostels, St Christopher's Barcelona, The Dictionary hostel, the yellow hostel, U Hostels Madrid, ultimate party hostel. Bookmark the permalink.